Gospel of Jesus’s Wife Likely a Fake, Bizarre Backstory Suggests – Zero Equals Two! This business card-sized papyrus contains a line that says, “Jesus said to them, ‘My wife…” Written in Coptic, an Egyptian language, the papyrus is now considered to be a modern-day forgery. A papyrus holding text that suggests Jesus Christ was married and whose authenticity has been a matter of intense debate since it was unveiled in 2012 is almost certainly a fake. Karen King, the Harvard professor who discovered the Gospel of Jesus’s Wife and has defended its authenticity, has now conceded that the papyrus is likely a forgery and that its owner lied to her about the provenance and his own background. 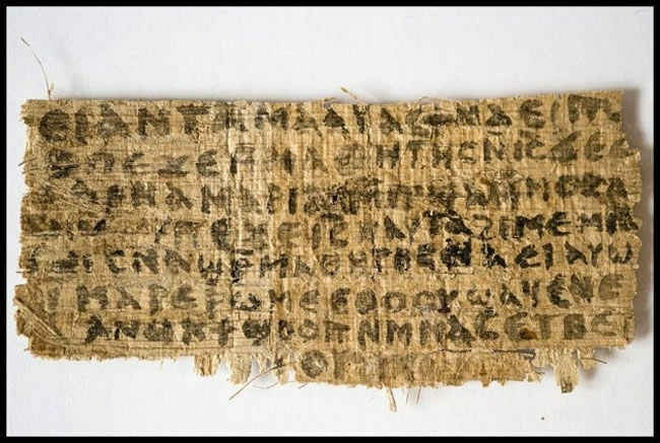 The concession comes after Walter Fritz, a resident of North Port, Florida, revealed that he is the owner of the papyrus that claims Jesus had a wife. Fritz said this to Ariel Sabar, a journalist for The Atlantic who wrote an exposé published June 15.